In partnership with the Kingsman: The Golden Circle movie currently in theaters, Hard Rock Cafe has put out a limited-time Kingsman-themed burger. 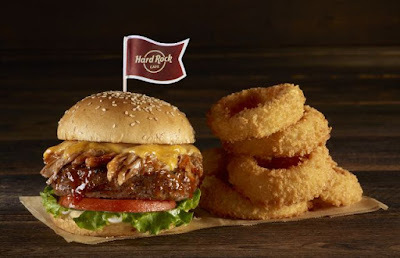 The new Poppy Burger (so-named for the movie's villain, Poppy, who prepares a dubious burger during the course of the plot) features a bourbon-whisky-glazed half-pound Certified Angus Beef patty topped with pulled pork, cheddar cheese, garlic aioli, lettuce, and vine-ripened tomato on a toasted sesame seed bun. A side of "Golden Circles" (onion rings) come on the side. The Poppy Burger can only be found at select locations worldwide through Friday, October 6, 2017. Photo by Hard Rock Cafe.